Back in October I really thought that the season was over with the last brevet. A nice October day and a fine ride to put a bookend on the season. But that just isn't how it worked out. This fall was the fall for permanents. Now that I own my own permanent which practically leave from my doorstep, I had a hard time resisting the nice fall days of October. I also had some offers from new people that I had never ridden with before. So during October, I did 2 more 200ks and then another 200k in November. All the same Delano-Henderson-Chaska loop. Each one was different in its own way. My first was the trial run by myself going counter-clockwise on the loop. Nice ride with bizzare weather - it vascillated between very hot and very cold. Next, I had a call from a new randonneuse who had never done a permanent. How could I possibly say no to helping another female into this sport? Yet another fine ride, this time clockwise on a cold morning that turned into the last day of the season you could wear shorts. Finally, a bunch of guys called me in November about doing the same route again. These guys are people I have known for years, but are all substantially faster than I am - thus I see them only at the starts of brevets. This ride, we all stuck together for and we really had a good time. The DHC permanent looks like it will be a success and I have my 300k route ready to go for next year. Which brings us to mid-November and the end of fall as we knew it. The Twin Cities got hit with a major snowstorm on Veterans Day and for the next 6 weeks, we got over 3 feet of the stuff with sub-zero temperatures to boot! Hardly riding weather. I proceeded to buy a new winter bike, one that costs so little that I could justify having it corrode over the nasty winter months. A Kona Dew Plus on sale for $290. But it has disk brakes which I figured would be a real plus if it were going to snow like Greenland. I thought back to my ride on Rob's Sakatah permanent last year. Starting in the low teens and never hitting twenty really is tough (it's the no fluids except at controls that gets you). It also didn't help that every 3 days we would get either more snow or a cold blast that made the neighborhood snowman look cold. But finally, near the winter solstice, a break was coming. A day that would be in the 20s all day long. Of course, we had a 6 inch snowstorm 2 days earlier and more on Christmas, but this was just in between. But this time, I was not to be alone in the quest. 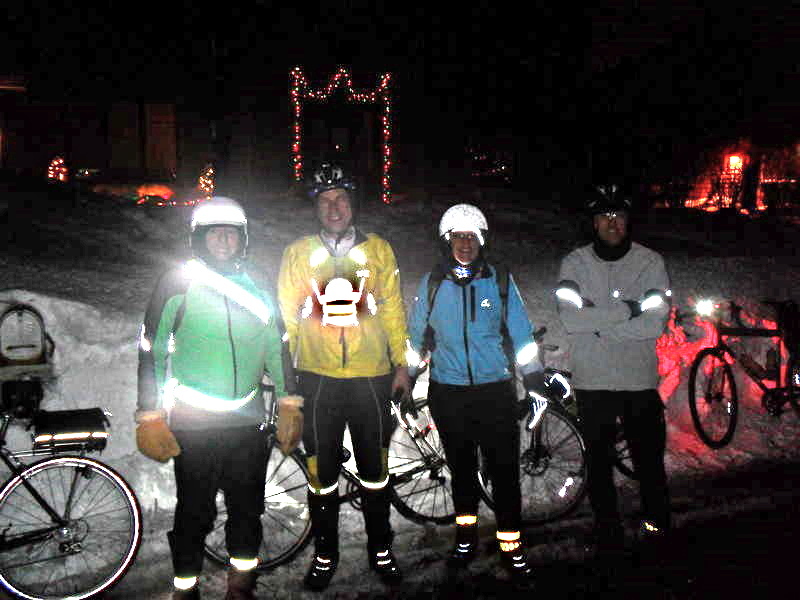 There were 4 other guys that decided that it just isn't right to only have one person in Minnesota willing to do 200k in the dead of winter. Two of them I had ridden with in November, Jonas and Norman. Gary, I also knew slightly from creating jerseys and other odds and ends. Jeff, I had never met. Of course, it was the 20s with major slush on the road and not much in the way of daylight (a full 8 hours). My permanent was simply too hilly and potentially dangerous. It's now closed. But Rob had recently tweaked his for the winter and promised a good ride (even if he himself couldn't make it). So back to Apple Valley for more randonneuring sponsored by Kwik Trip. The five of us left at 8:00 am just as it got light. It was as warm as it was going to get at a balmy 30 degrees. We were a little worried that it would be too warm and the slush would get us wet and cold. But indeed, luck was upon us and we had nearly the perfect weather, not much wind, stable temps and near deserted roads. We had a big tailwind and we pounded our way out of Apple Valley much faster than we probably should have. There wasn't much left from the snow storm, but one does want to keep warm. All of us had fat, studded tires. While affording great traction, they really do take some work to get rolling and keep rolling. I was happy I had added fenders both for myself and the guy behind me. Sometimes it can be difficult to have both fat tires and fenders, not a luxury everyone had on this ride. But we all made due and it turned out to mostly not be a problem. We paused about 15 miles in for a drink at a Shell Station. At this point, I realized that there is a big difference between the low teens and the high 20s for sports drinks. Nothing was freezing up at all! So I just refilled my bottle and off we went. The ride to Faribault was all tailwind and we got there around 10:30 with a moving average of 14.2mph! That's really fast for riding on studs. We ate as much as we could at the gas station and headed off with only about a 20 minute stop. 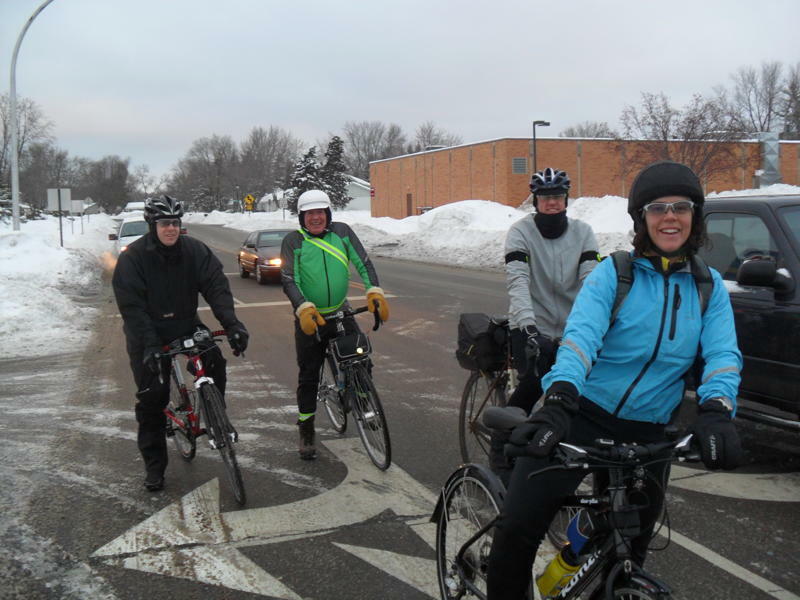 At 34 miles, Faribault is the longest segment, although the ride to Cleveland seemed longer. The next 31 miles were on a series of country roads that Rob picked out for the winter. There were virtually no cars and I slowed a bit as did Gary. He's a really interesting guy, 70 some years old and still a faster rider than I am. The others went ahead a bit, but waited on occaision. At about mile 55, they were ahead again, when I realized that we were no longer on a paved road (very hard to tell when the road is covered in snow). Turns out there was a turn missing on the route sheet. The others soon came back and we got back on course. We got into Cleveland, the halfway point at about 1:15 and took a more substantial break (almost 40 minutes) to eat pizza, soda, coffee, candy bars and all the other food that you can really only feel good about eating when you are burning thousands of calories. The BP station had a little eating area and we chatted for awhile. I loaned my multi-tool to Jeff, who had cleat issues. We pulled out of Cleveland at about 2:00pm bound for Lonsdale. This section included a bit of headwind as we swung north for the first time. I fell behind a bit having burned a bit too hard early in the ride and being deep in the throngs of digestion. We got in a line and I pulled as much as I could. The day was a grey one and this was a nice stretch with no cars. About 4:00pm we pulled into Montgomery and I was desparate for the bathroom. Another problem with winter riding and females - you just can't pull up a tree whenever you need one. I left a bit ahead of the others as I was huffing a little. They easily caught up just outside town. Lonsdale was a quick 10 miles and it was here that I made my 2 major mistakes of the ride. First, I should have used my inhaler (exercise-induced asthma go figure). My second mistake was arguably not mine. Norman is from Germany and Jonas is frome Sweden. At the control, the clerk was so enthralled with Norman and his accent that she didn't hear me when I asked for a receipt. At the time, I was both wondering about my lungs and having a major inward laugh and the epic flirtation going on. We finally left at about 5:15, now in the dark and I got two blocks before realizing I had no receipt and having to go back. I offered to catch up, but the guys waited patiently. The clerk offered me the most recent receipt off the register, but it was for 6 cartons of cigarettes. Now really, who is going to believe that I bought 6 cartons of cigarettes at a brevet control! I settled for an emergency mint purchase and raced back to the others. The final 28 miles were mostly pleasent with the exception of CR8, again my least favorite road on this permanent. A busier road with a small snowy shoulder and a very large buzz strip just makes for treachery. My lungs started burning as well and I wondered if I was going to have issues when we finished and I came in out of the cold. I finally stopped and dug out my inhaler on the road. Not a good time, but it helped enough to get me back. At the turn onto Ipava, Jeff made a light feet in front of the rest of us and kept going. Unfortunately, he missed our group photo with Christmas lights. I like our group photo. It shows the massive depth of the snow (the banks are much taller than the bikes are). I especially like the big crown on Norman's head. The red glow on the snow is from my rear light (it's visible from orbit). We got into the Kwik Trip at about 8:30 pm. 12 mph as a moving average, which is considerably faster than I went last year. We stopped more frequently and for much longer periods, but I would not have done it differently. The winter is just not the time for breaking speed records. There is some talk about another permanent in January. Not sure about that, my asthma has been kicking up like crazy ever since. Nonetheless, I will likely talk to my doctor about getting something stronger. This was a fun enough ride to justify the lung stuff.